A lovely healthy bruschetta recipe to enjoy on it’s own or to eat with salads. 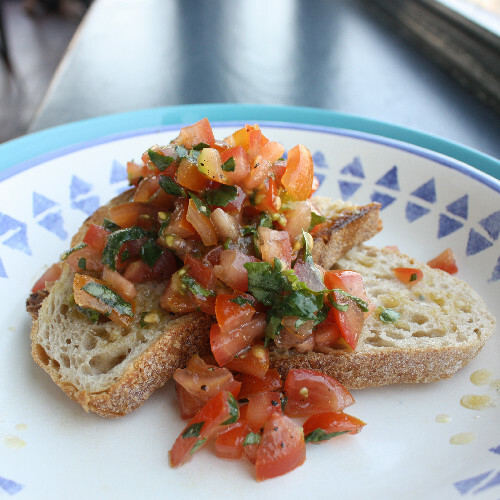 This bruschetta will make you feel like you’re in the Mediterranean whatever the weather! Bruschetta is a great choice to give your heart and blood stream a dose of protection. Olive oil helps maintain healthy levels of LDL cholesterol in our body and providing Vitamin E and essential fatty-acids. Rich in phenolic compounds providing antioxidant and anti-inflammatory properties. Don’t forget to slap those basil leaves to release and enhance their incredible aroma. Finely chop the tomatoes and add to a bowl with the olive oil and a pinch of salt and pepper. Tear the basil and add to the tomatoes. Heat a griddle pan and cook the slices of sourdough on both sides until slightly charred, so that the lines appear on it. Slice the garlic clove in half and rub on both sides of the bread. Top the bread with your tomato and basil mixture.